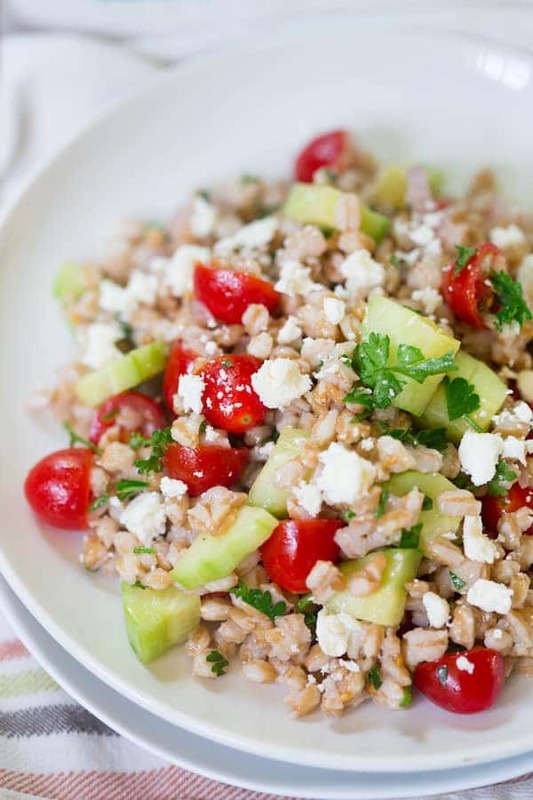 Cucumber and Tomato Farro Salad is a super fresh and healthy side dish or light meal! Lars and I have been in Iowa since last Thursday doing a little tour de Iowa, visiting my family. Ever since having Lars I’ve wanted to be able to spend more time in Iowa with my parents. Even though they come up to visit pretty often, I really love going back to Iowa to spend time out in the country. While I grew up in a “city” in Iowa, both of my parents moved out into the country since I left home for college and it is pure heaven to visit them both. There’s something about literally being out in the cornfields, in small town Iowa, that makes me feel home. The thing is, I’ve planted a garden the last two summers with mediocre results. I’ve always crammed way too many different plants into a small space, which was definitely not a “the more the merrier” situation. This year, however, I took out a couple of hydrangea plants that weren’t doing anything for me, and made the space into more garden space. So far, things have been looking awesome and I can’t wait to see what it looks like after a week away! 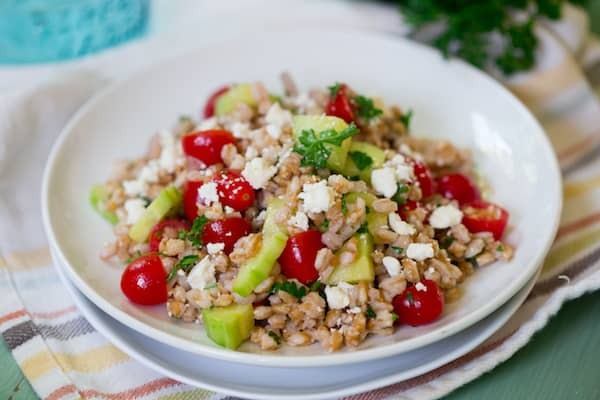 I’m also excited to make this Cucumber and Tomato Farro Salad again with the tomatoes, cucumbers, and parsley that I planted. The first time I made it was for my brother-in-law and sister-in-law who just had their second baby. Unfortunately for them, I forgot the entire bag of food that I made for them in our kitchen. Luckily most of the food was able to be frozen and I delivered it to them the next week but this Cucumber and Tomato Farro Salad didn’t seem like it would freeze well. So – lucky me! – I was stuck with eating it all. 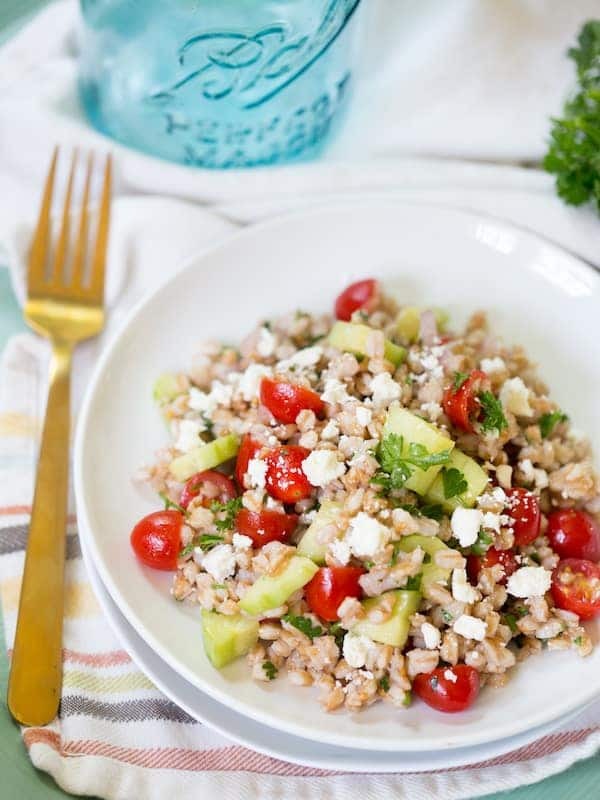 This Cucumber and Tomato Farro Salad is super fresh and clean! 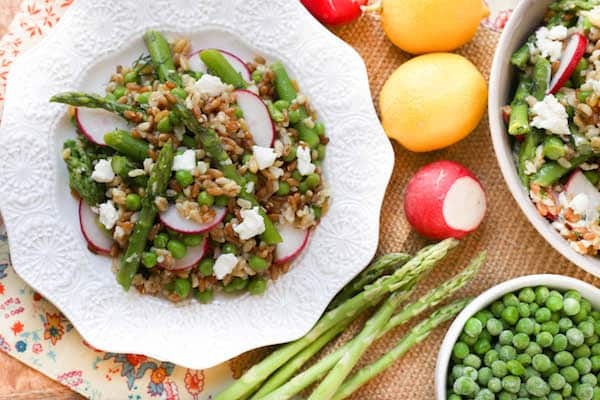 Farro is one of my favorite grains these days – it’s really easy to cook and extremely versatile. I’ve even used it as a breakfast cereal! 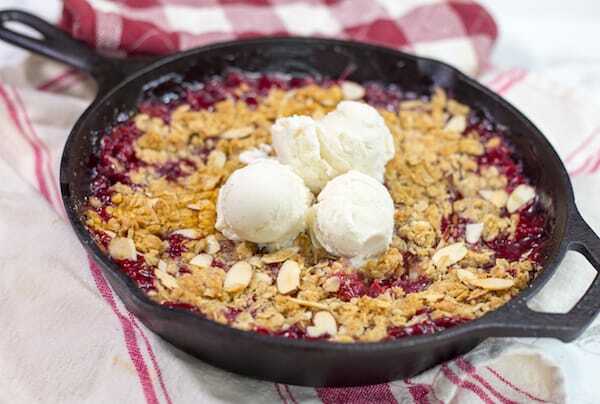 It pretty much takes on whatever flavor you give it, and is full of whole grains. For this salad, the dressing is very simple – just olive oil, red wine vinegar, garlic, and shallot. 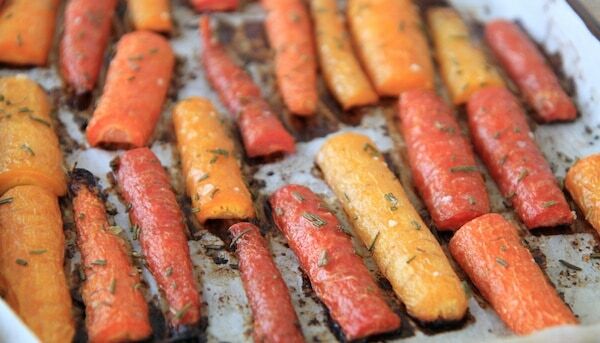 This gives it some flavor but really lets the other ingredients like the fresh produce, shine. I also added some feta cheese because, why not? This was great as a side dish to grilled chicken and as a light lunch, or would also be great as a BBQ/potluck side dish. Bonus points for using produce from your garden! Cook farro according to package directions and cool completely. In a small mason jar, add olive oil, red wine vinegar, garlic, shallot, salt, and pepper. Shake until well combined. Alternately, you can do this step in a small bowl and whisk it all together. I just find doing it in the mason jar is easier. Pour dressing over cooled farro and stir to combine. Add diced cucumber, cherry tomatoes, feta cheese, and parsley, and stir to toss.